Better late than never right? I realized that in the rush of teaching this last fall, I never finished posting about Yellowstone. While I have enough pictures to last for several years of posting, I will keep the old trip reports to a minimum while still telling the rest of the story about Yellowstone. The fishing was, well, let's just say a little unusual. The great water last summer meant that my normal late July and early August expectations weren't met but that wasn't necessarily a bad thing! My fishing focused mainly on the Gibbon and Trout Lake. The Gibbon because we camped at Norris and Trout Lake because we took a couple of hikes there for photography purposes. Convenience was the name of the game. On a trip where fishing was definitely not a primary goal, I was fortunate to still get out on the water a fair amount. Early mornings and some late evenings were ideal times to sneak away and fish the upper Gibbon through the meadows by Norris Campground. The setup was made even sweeter by the fact that we were just entering the prime terrestrial months and the Gibbon contains a healthy population of brown trout (at least for now). Early mornings were spent probing cut banks, deep bend pools, log jams, and any other fishy looking structure for chunky browns. The best brown of the trip required some effort to catch which is as it should be. It first showed itself when it flashed out from under an undercut bank about 20 feet below a nice bend pool. Just before annihilating my fly it must have got a glimpse of me lurking nearby, responding by slamming its mouth shut and vanishing back under the bank. The next couple of days featured early morning visits back to "the spot," but I failed to get another glimpse of the fish. Finally, the time seemed right. By this time my cousin, his wife, and another friend and his wife had joined us in the next campsite over. As everyone else was just getting around to thinking about breakfast I announced that I was going to catch that fish. Having laid it all on the line, I had to endure a gauntlet of good-natured jokes as I headed down to the water, "You mean like you went and caught it yesterday? Or how about the day before?" My response was to remind them that I never actually said I was going to catch the fish on those other days. With my fishing reputation at stake, I decided to do everything right. This meant crawling along the stream at least 7-8 feet back from the bank and only raising the rod high enough to toss my offering out. Finally, right in the deep bend cut 20 feet above the spot where the fish first was spotted, the fish struck. My fly had just smacked the water when a golden brown flash engulfed the pattern. On this particular morning breakfast bit back and the fish was soon in my net for the necessary picture so everyone would believe my fish story. A friend had followed me down and did the honors with my camera. Not all fishing featured brown trout. Even though I love browns, I enjoy catching other trout as well. One of my favorite locations in Yellowstone is Trout Lake. The resident rainbows, cutthroat, and cutbows can grow to ridiculous sizes. Past trips to Trout Lake have resulted in rainbows up to 24 inches being landed. This past summer that was not meant to happen. I did see one gargantuan rainbow cruising on one of our forays to the lake, but it was spooky, and I never got a good cast over it. The cutthroat were another story. The inlet was filled with spawning fish and plenty more were stacked up just below in the deep water. This area is off limits to fishing and rightfully so. The fish have enough stress to face with the lake's otter population. There were just enough nice fish out and about cruising the shoreline to keep me interested without making things too easy. As always, it was not easy to trick one of these fish but when I did it seemed like a bit of an accomplishment. A float tube would be the best way to fish this lake, but I made do with what I had. The fishing was fun, but the real fun on this trip was the wildlife viewing. I caught browns, cutthroat, and brook trout which are always a treat but in the end, the trip will be remembered mostly because of the scenery and experience that is Yellowstone. A thread started today on the Little River Outfitters Message Board started me thinking about fly fishing memories. I'm going to start sharing some of my favorite fishing related memories. For starters, here's one about a brown trout and a boy with a fly rod. 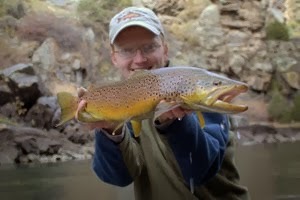 Before I even understood how to go about catching any trout, I dreamed of catching big browns. Early in my fly fishing career, I was doing good to scare up a small rainbow or two, but that didn't stop me from hoping for something more special. One day, my dad (who usually drove me to the park to fish) had taken me fishing. He never actually fished but was the first one to take me fishing when I was 4 or 5 and almost the only one who ever took me before I was able to drive myself. This particular day was a beautiful early June day. We had explored several areas, but I was not having particularly good luck with just a few small rainbows to hand (from Tremont if I remember correctly). As sunset was approaching, we stopped at one last pullout, this time on Little River. My dad was tired and decided to stay in the car. When I started driving myself, I came to understand why people would be tired late in the day, but at this point I was blissfully unaware. 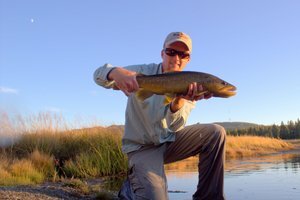 I trekked down a dim but short path to the stream and began tossing a yellow Stimulator. I worked my way to the head of the pool and was casting in the pocket immediately above the main hole when I first saw the flash of gold. A nice brown came out and circled furiously around my fly before disappearing back under the white froth. Two more casts produced similar results and then the brown seemed to have vanished for good. Desperate measures would be needed. 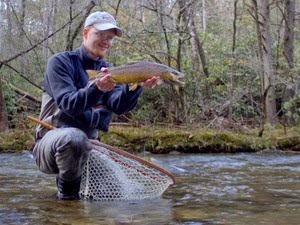 Recalling how I had enticed a big Abrams Creek rainbow by dancing the fly on the surface during a hatch, I contemplated a similar trick. The big Stimulator was soon skittering across the surface and almost immediately the brown reappeared, charging through the water towards my now tantalizing fly. One last mighty twitch brought the intended result. I was now attached to what I then viewed as a monster. Carefully battling the fish down through the pool, I finally brought it close enough to land. 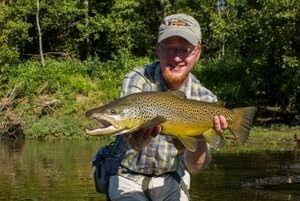 The 14 inch brown was heavier than many similar sized fish I have since caught. 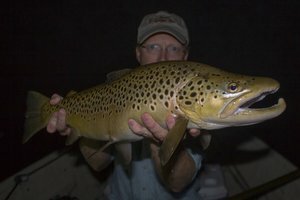 I will always remember that first nice brown even though I now dream of fish measured in pounds and reaching well over twenty inches. That fish was a major accomplishment to me as I am mostly self-taught, and at this point in my fishing career wondered if I would ever catch anything over 10 inches. Next summer is shaping up as another great water year out west and in particular for the northern Rockies. Obviously there is really no way of accurately predicting the amount of snow but all indications are pointing towards another good water year. La Nina is back which was one of the main reasons for last year's great snowpack. Current long range climate outlooks from the Climate Prediction Center are forecasting the likelihood of above average precipitation across large portions of the west. Unfortunately, along with that is a good chance that the south central and southwestern states' drought will continue. In Yellowstone this past summer, there were still numerous snow banks on the higher north-facing slopes into August and the Tetons still had plenty of snow at that late date.